Hello! We're glad you're here! 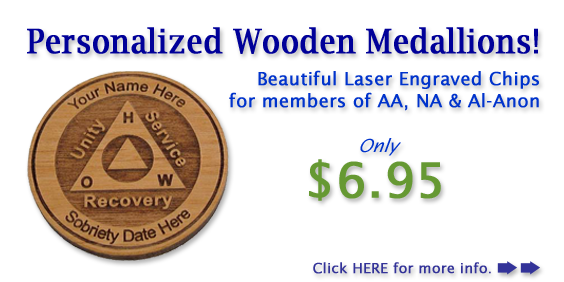 In addition to having just found the makers of The Original Wooden Recovery Medallion, we hope you'll enjoy browsing our selection of beautiful Bronze AA tokens and Al-Anon Anniversary Chips, personalized Recovery Pocket Gems, customized AA & NA Medallion Holders, Slogan Plaques, Recovery T-shirts, custom vinyl Wall Words and Decals, and so much more! We even have a great selection of Word Stones, Recovery Buttons, 12 Step Key-chains, Recovery Themed Coffee Cups, and Personalized Silicone Wristbands! Although you'll love our many standard design recovery medallions and gifts, you'll find that our affordable personalization options make these unique recovery gifts even that much more special! 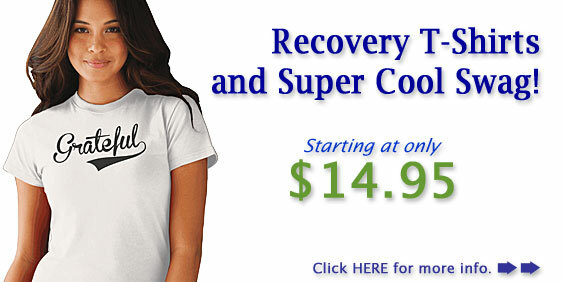 Fast and affordable personalized recovery gifts is just one of the things that sets us apart from the others! Thank you to all who have contacted us with comments, suggestions, ideas and inquiries! We've received just a ton of suggestions for new chip designs, plaque phrases, recovery gift ideas, etc. and we welcome your input, too! As we are the manufactures, we can quickly turn your ideas into reality! 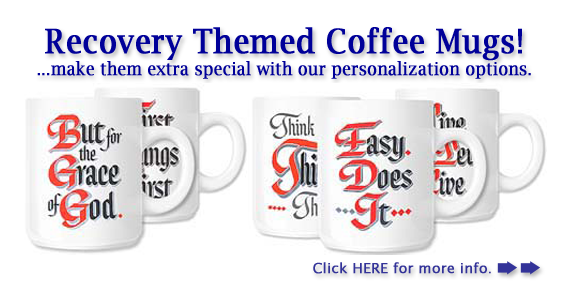 We manufacture all of our recovery gifts; wooden medallions, plaques, glass gems, t-shirts, buttons, keychains, decals etc. right here in our North Carolina shop! 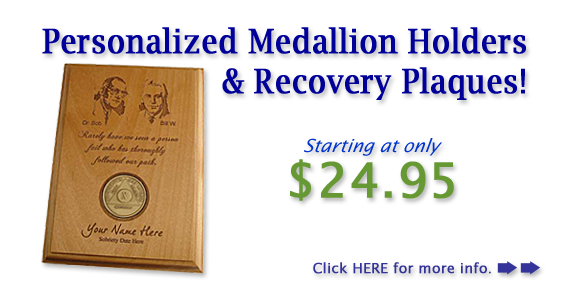 Personalization of our recovery medallions and 12 Step Gifts is fast, easy, and affordable! Just ask us how! We are happy to accommodate requests for bulk orders for your Home Group, Intergroup, Central Office, or other recovery community purposes. Please contact us today to establish a group account. If you are purchasing for a recovery gift shop, or are a vendor of recovery related gifts, we would love to hear from you, too. 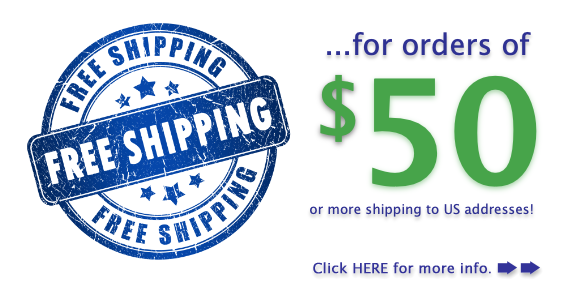 We have a wonderful program for resellers! Please feel free to contact us. Please let us know if you have any suggestions for recovery gifts that we could offer our community. Thanks in advance for your input. Together well grow! Standard designs or customized to your specification. 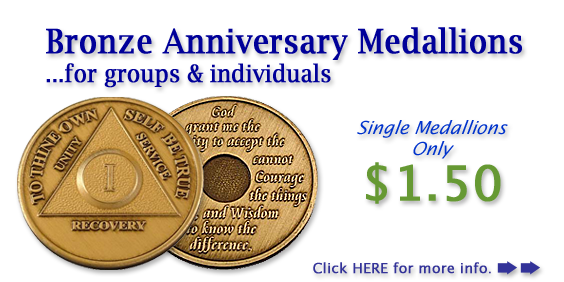 Learn more about the History of A.A. Medallions and the Chip System.